Earrings tell a lot about a person, be it a woman or a man. They are accessories which “shape” the personality of those who wear them. This is why you have to choose your earrings carefully, since they will tell your story. Do the research, carefully choose the material, as well as the size and the shape. In order to save you some time and help you choose the earrings that fit your character and personality, we have listed some interesting choices. Maybe you’ll find the perfect one for you! This is an earring which is very easy to insert and comfortable to wear. It is made of high quality 316L surgical steel and brass with rhodium plating. 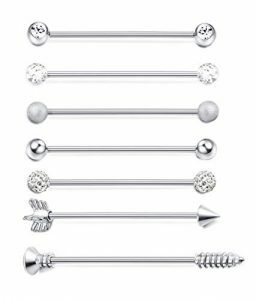 You can choose from various lengths; the ball size is 5mm. You can check your size on the conversion chart and choose the suitable one for you. We recommend you pay attention to the distance between the top and the bottom earlobe. The customers’ reviews are positive, so you can definitely check this earring! You may be surprised at how good it may look on you! If you are looking for a set of earrings, then this one may be your choice. It includes 7 pieces and is available in more tones – silver tone, gold tone and rose gold tone. They are made of stainless steel, are solid and durable, as well as shiny and easy to insert and wear. They have a length of 38mm and the gauge size is 14. The jewelry is also characterized by clear screw thread design, so that you can easily take them off. More than that, if the size does not suit you or if you do not like the product, you have a 365-day exchange or money back guarantee. The earrings come in distinct and original shapes and you can combine them with different suits. This earring may be a good choice if you want an original and interesting shape. It is an earring which has a lotus flower with leaf dangles on it and it is perfect for someone who likes this type of design. 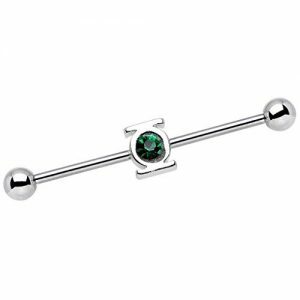 Its gauge size is 16 and the barbell length is 38mm. It is made of stainless steel and it is not resizable. It also has little rubber bands so that the decoration – the lotus flower – won’t move from side to side. You can also move and leave it where you want. You can wear it with both casual and elegant outfits. Are you a superhero fan? Do you like Wonder Woman and want to share this with your friends? 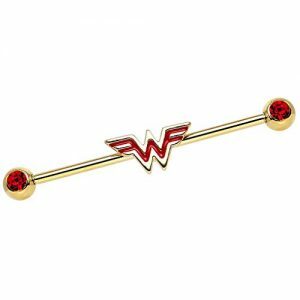 Then you can purchase this earring, since it has an officially licensed DC Comics Wonder Woman logo. The logo does not move, so it will not create discomfort. It has a length of 35mm and a diameter of 1.6mm. The jewelry is made of stainless steel and gold. It is stylish, interesting and original. You can match it to different outfits and be unique. More than that, these types of earrings could be perfect teen gifts if you are searching for one. Surprise the others! This is one of the most original earrings for men. We suppose you are wondering why. Well, this is due to the DC Comics Green logo charm set with a green accent. Its length is 35mm and the diameter is 1.6mm. The jewelry is made of stainless steel. This product is available only in the US Market alone, so you will be pretty lucky if you get to buy it. It will showcase your personality and your preferences. This earring may be the accessory you have been searching for so long! For centuries earrings have been the perfect jewelry to stand out from the crowd and show your social status. Opulent pieces of jewelry were displayed in daily life by worldwide leaders, no matter the culture. From the ancient Romans to the Egyptian pharaohs, body pieces of jewelry were present on both men and women to display their richness and noble origins. Back in our days, earrings have remained pieces of jewelry adorned alike by men and women and still used to make a statement about the personal style or accessorize every outfit. Round, diamond-shaped, ear drops, hoops or others – no matter the style, earrings are still some of the most present accessory items in our daily wardrobe choices. And, with so many options available on the market, it is quite impossible only to choose a style that will best suit your occasion and desires. If you don’t have the necessary time to wander through jewelry shops but still want to enhance your personal collection of earrings, our following comprehensive shopping guide will show you some of the best industrial earrings designs right now, as well as the top things you need to take into consideration when buying a new pair of earrings. It is hard to keep track of the jewelry trends today since every day seems to appear something new, shinier, and better looking. 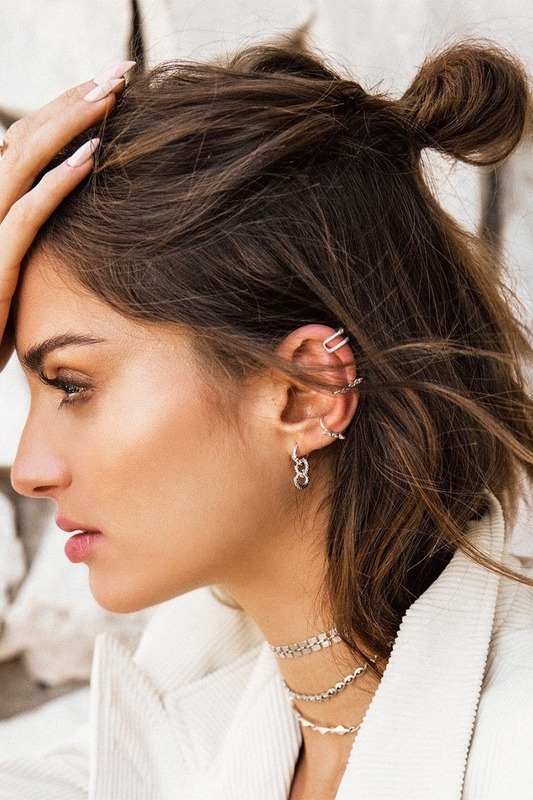 Luckily, when it comes to industrial earrings, you don’t see too many innovative designs each season. Nevertheless, there are countless models to choose from, so here are our suggestions when trying to find the right pair. Finding the right pair of earrings could prove quite a hustle with all the options available in online shops and offline jewelry stores. But, with a little bit of research, we are sure you are going to find exactly what you are looking for. 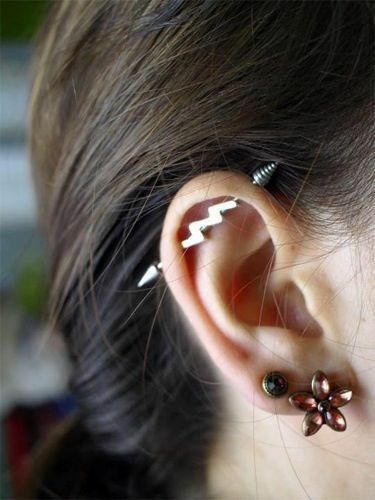 It is worth checking some industrial earrings reviews to see the current styles and decide upon a type that will best match your fashion sense and personality. You can always get inspiration from online fashionistas and jewelry blogs if you feel like you haven’t yet found the best pair. Moreover, if you don’t have too many options available in your local shops, you can always look for sale models and order online to make sure nobody will have a similar style. One of the most important aspects when searching for cool steampunk earrings or any type of earrings for that matter is the material they are made of. Most of them are made of metal, but you need to closely pay attention to alloys or materials that might irritate your ears or cause future infections. We do suggest opting for precious metals like silver, gold or platinum to avoid the risk of infections in time. However, some people can still be allergic to silver, so, in that case, it is best to opt for metals that won’t cause corrosion or further ear infections. If you are not sure whether or not you are allergic to a certain metal, try wearing a pair of old earrings made from the same metal for a couple of hours, even a full day. If your ear doesn’t get swollen, itchy or red, then you are safe. However, if you see signs of corrosion or develop itches, carefully disinfect the ear using sanitary alcohol and consult a medic. Also, before wearing any new pair of earrings, make sure you have properly sterilized it with solutions or alcohol. To avoid further infections or itches it is advisable to do so with all your earrings at least once every couple of months, depending on how often you choose to wear one pair. Materials should also be chosen according to the occasion, just like the style of your earrings. We suggest golden earrings for preppy occasions such as nights at the opera or suit and tie galas, whereas silver earrings can be worn on a regular basis. Another aspect to take into consideration is the shape of the earrings. Similar to the materials, the shape of the earrings should also be chosen in compliance with the event and your personality. Hoop earrings should be mainly considered for informal events such as nights out with friends or coffees in the afternoon. Due to their large dimensions, you should avoid wearing them at work or at formal meetings. On the contrary, chandelier earrings are mainly suited for extravagant occasions or lavish parties and should be mainly worn without any other accessories. When we are talking about clip-on earrings, whether small or tear-drop ones, they can be worn on various occasions, even at work or parties. The advantage of these versatile styles is that they can be associated with numerous looks, makeup styles, and clothes, but the result will always be an elegant one, no matter your options. If you plan on buying a pair of earrings for men, bear in mind that the most important aspects are size and material. We do suggest men opting for small-sized piercings without too many blings. If you wear the right type of earrings, you can even pair them with a tuxedo or an elegant suit for an extra touch of style. On the other hand, large earrings on men tend to look tacky and more into the “hood” zone. They are mainly associated with rap singers or “bad boys” so, if that is not your style, we suggest avoiding them. Not to mention, too opulent earrings tend to distract your attention from anything else and should only be worn occasionally. In conclusion, no matter your style, we suggest opting for items that will suit you and your physical appearance. Avoid painful earrings which are too heavy or too long and could cause ear lobe problems. Similarly, never wear a pair of uncomfortable earrings, no matter how cool or fashionable they may seem. If you don’t know what to wear, a simple pair of round-sizes or diamond-cut earrings will match almost all outfits and will make a discreet fashion statement.